Handel's vocal works are performed by choirs throughout the world. Carus is constantly expanding the range of works by Handel it offers in its catalog including the well-known works as well as musical rarities. Handel fans can now look forward to a 13-CD box set with excellent performances! Have fun discovering about our new issues! P.S. : Come and discover Carus at the AGO Houston 2016! Our Head of Sales Emanuel Scobel is awaiting you at the music exhibition, Booth #318 to show you our new publications for organ, as well as beautiful recordings and our special app for choir singers. 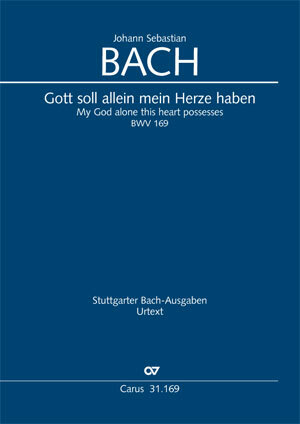 Newly released are the Bach cantatas Widerstehe doch der Sünde BWV 54 (Stand firm against the lure of sinning) and Gott soll allein mein Herze haben BWV 169 (My God alone this heart possesses). With the Bach vocal project we are publishing the complete edition of Bach's sacred vocal music in time for the Reformation anniversary in 2017. 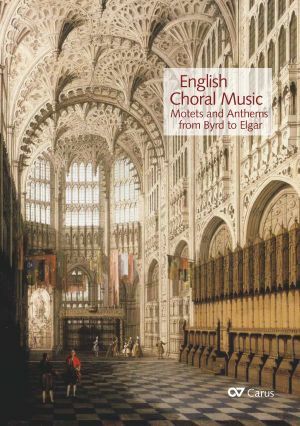 This volume ... should really be in every music library as a handbook of British choral music. All in all, we can only wish that this volume finds a wide circulation. It offers the best basis for experiencing British choral music and will hopefully encourage people to explore this repertoire further. NEW: As well as the conductor's volume with CD, an cost-saving edition for choir (editionchor) is now available. 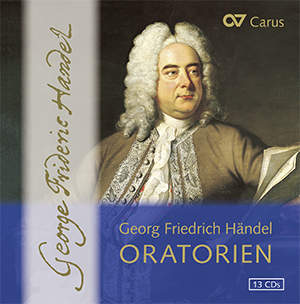 Beginning in 2009, Carus launched a CD series of Handel's oratorios, plus selected vocal works, operas, and instrumental works. Handel fans can now look forward to a 13-CD box set with excellent performances! Handel's vocal works are an established feature of our publishing programme. Carus is constantly expanding the range of works in the Stuttgart Handel Edition Urtext. An edition of Handel's Alexander's Feast was the most recent publication. 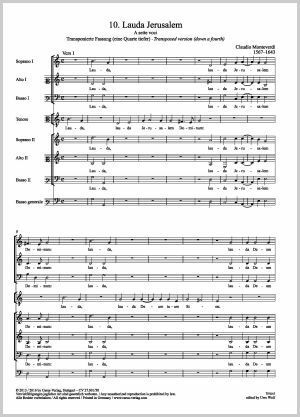 In many performances of Monteverdi's magnificent Vespers of the Blessed Virgin the Lauda Jerusalem and the Magnificat movements, which lie in a high tessitura, are transposed downwards. So that these can also be performed with the highly-acclaimed Carus edition, we offer both these movements individually a fourth lower. Complete performance material is available. 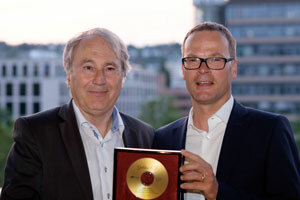 The conductor Frieder Bernius has been awarded a Golden CD by Carus Verlag for his complete recording of Felix Mendelssohn Bartholdy's sacred vocal music. 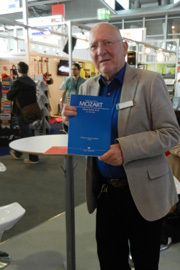 The award was presented to the conductor by publisher Dr. Johannes Graulich during the Deutsches Chorfest in Stuttgart. 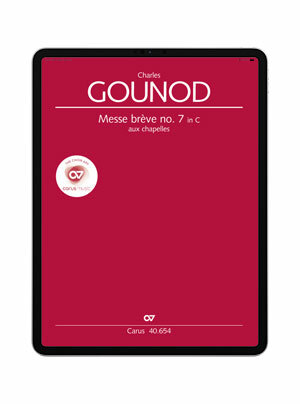 the Missa brevis by Joseph Haydn, Charles Gounod's Messe brève no. 7 aux chapelles and Telemann's cantata Machet die Tore weit, which is sure to be performed frequently in the 2017 Telemann anniversary year. Try out the choir app free of charge – with one choral movement for each work. Since the World Youth Day in 2005 in Cologne Fauré's Cantique de Jean Racine op. 11 has been one of Paul Hogrebe's favorite pieces: The music almost floated through the still, cool cathedral: gentle, unassuming, heavenly, as if from another world – directly in contrast with the outside world.